Four Simple Ways to Build A Nautical Themed Bedroom - And Not Just For Kids! You may think themed bedrooms are for kids, and that we all grow out of having them with time, whether we like it or not. This shouldn’t be the case at all, because you can make a themed bedroom for adults and have it still feel classy and mature. Isn’t basing a room around just a solid color starting to get dull? 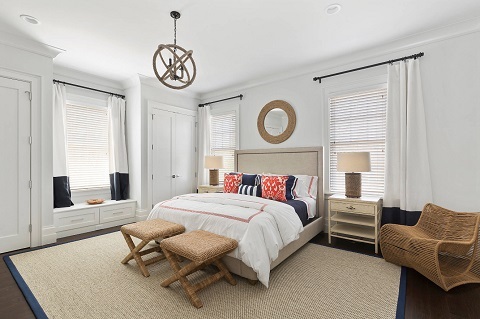 Nautical themed bedrooms are sophisticated enough for an adult, relatively simple to achieve, and still have that hint of playfulness and beach-side R&R. Through the combination of stripes, driftwood, rope, and other seaworthy accessories, you can bring the ocean side home with you in the form of a nautical bedroom. We associate stripes with sailors because it used to be a clothing tradition to wear Breton-striped shirts at sea for easy identification. 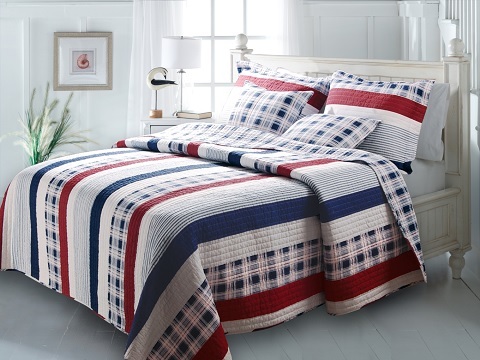 Through bedding or curtains, you can express this piece of history in your bedroom. As for colors, look for deep reds, ocean blues, and stormy grays. Anything too vibrant may feel too childish, or worse, give you a headache after a while, so stick to darker tones and shades rather than bright primary colors. Driftwood is a kind of marine debris that has literally washed on shore from rivers and oceans, and many woodworkers have taken it as material to create furniture and accents. 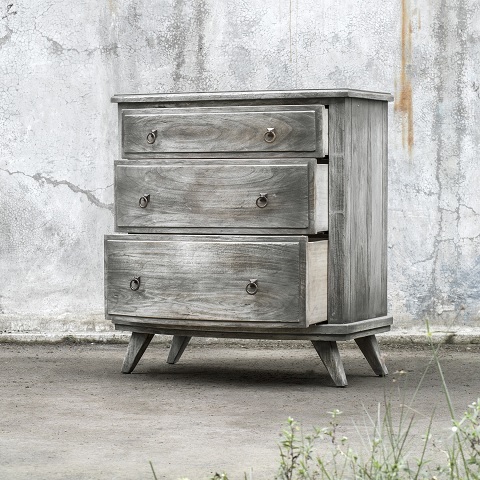 A bed frame, wardrobe, or dresser made of driftwood has battled the ocean before setting up residence in your room. The resulting look and texture is reminiscent of beach houses by the waves. In some cases, finding good driftwood pieces can be difficult, so you can substitute it with faded and artificially weathered wood to have a similar effect. Though we as a land society don’t require rope rigging to make our cars drive in the correct direction or keep our houses anchored to their lawns, the material can still come in handy when decorating for a nautical theme. Wall shelves can be secured with rope on both sides instead of a wooden base underneath. You can also hang art on your walls with a sailor tied knot and show off your craftsmanship. Just like their presence on ships, you can use rope throughout the room to help you secure your belongings and decorate. While in actual nautical settings it’s strictly functional, rope can also be used as a decorative element for your bedroom. Furniture like accent chairs, table lamps and chandeliers can have a rope covering which adds no extra function, but gives the pieces a hand-crafted feel. This is a nice way to trick your brain into associating these things with the ocean aesthetically without compromising the comfort level a bedroom should give you. There is only so much you can do with a room’s furniture to give it a nautical vibe. A great way to supplement your bedroom’s theme is through wall art and statues, bookends and paperweights, throw pillows, and more. 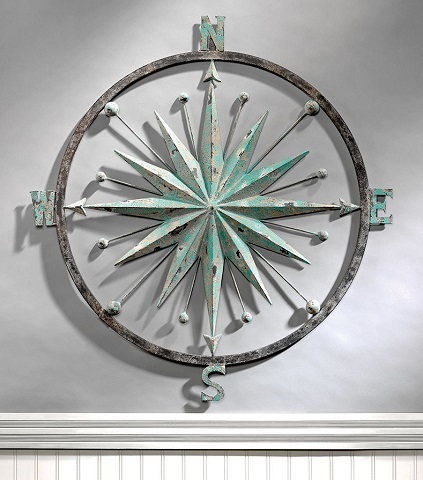 Common nautical symbols to use in your room are a compass rose, anchors, a ship steering wheel, seashells, and fish. You can’t go wrong with tasteful wall art of a boat at sea, but remember you don’t want to go overboard with the ship decorations; two or three accents to your furniture should suffice unless you have a large amount of space to work with. 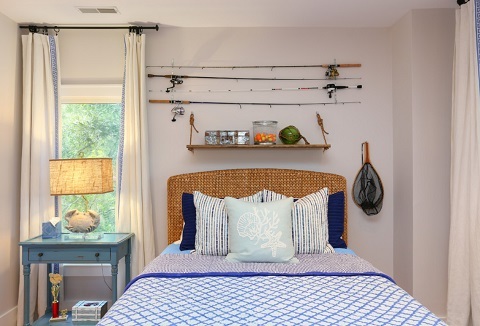 The trick to making a mature themed bedroom is through creative application of existing theme elements instead of a complete makeover with fish wallpaper plastered around your room. This entry was posted in Bedroom Ideas, Decorating Ideas and Tips, Furnishing Ideas and tagged Bedroom, nautical, nautical bedroom, themed bedroom.